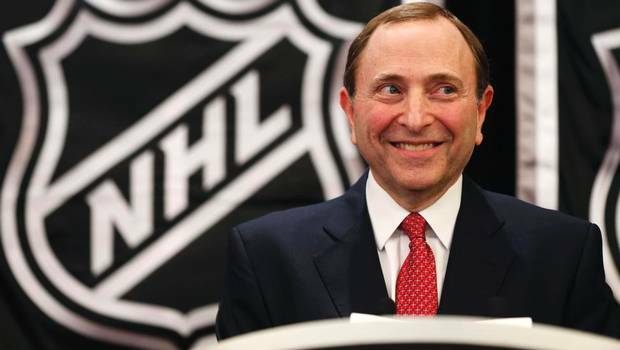 These 2018 PyeongChang Olympics isn’t the first time the NHL didn’t participate in the quadrennial hockey tournament, and it probably won’t be the last either (looking at you, Bettman). 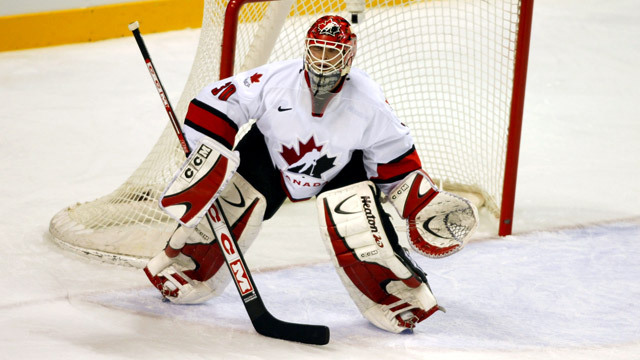 But that doesn’t change the fact that a team representing Canada has always been there*, wearing something. Some years, Canada looked better than others, which made us think…when did they look their best winning all those gold medals? Don’t worry, we tried to make sure all that success didn’t influence which jerseys were selected for the list…but like we’ve said before on this site, jerseys always look better when holding a Stanley Cup, or in this case, with a gold medal around its collar. Oh, and don’t look for this year’s jerseys on the list. They won’t be here. These jerseys are quirky enough to be mentioned, but slightly too quirky to make the top five. First off, it’s a predominantly green jersey (well, white with mostly green elements), which is strange enough for a Canadian team. 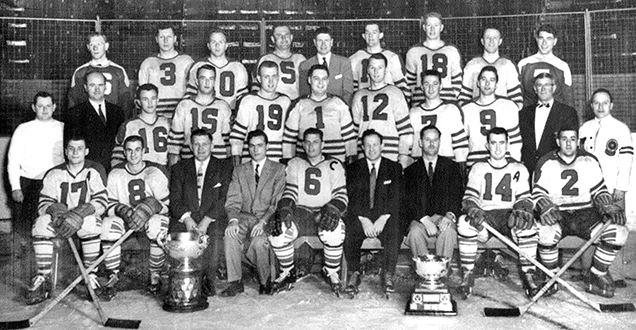 But up until 1964, the Canadian Olympic hockey team were usually represented by the most recent Allan Cup winners (the best senior amateur team in the country). And the Kitchener-Waterloo Dutchmen were the 1955 Allan Cup winners, and their jerseys look somewhat similar to the 1956 Olympic jersey. It was less of an issue because what you know as the Canadian flag wasn’t the Canadian flag until 1965. In 1956, the Canadian flag looked much different, with green maple leafs featured within a coat-of-arms and placed by the Union Jack. But a red maple leafs was still commonly used, specifically by all the Canadian military flags. Plus, in 1957 (1 year later), those green leafs on the Canadian national flag officially turned red. 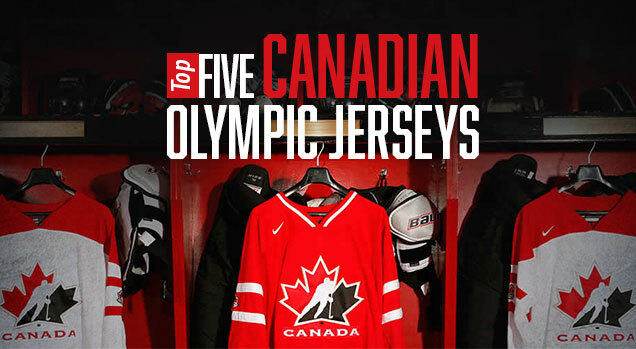 So, that gives you green-and-white jerseys a big green maple leaf on the chest and the large “Canada” right near the collar, with a roundel featuring a smaller red maple leaf right inside the larger leaf and the text “Olympic Games Canada”. So two maple leafs, two “Canada”s. Quirky af. And kind of redundant. If all the same elements had been designed differently, it could maybe work because the complimenting elements (the triple green stripes, the otherwise clean aesthetics of it) look really good, but overall, these jerseys are really crowded, especially with the larger “Canada” butting right up against the collar. As a historical note, the Kitchener-Waterloo Dutchmen were the only senior amateur team to represent Canada twice in the Olympics (bronze in 1956 and silver in 1960), and also were the last as Canada switched to a selected national team of players for 1964, and has done so ever since. 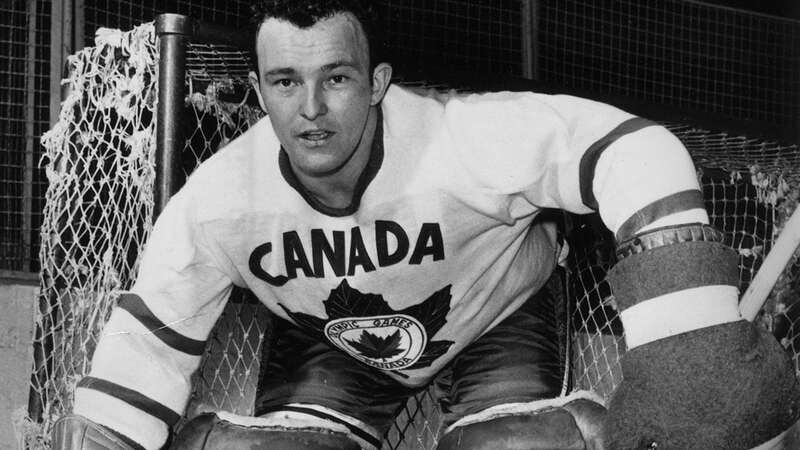 Also, recognize the Canadian goalie from the 1956 team? No? Maybe you’ll recognize his son? These aren’t the flashiest jersey, and there’s nothing incredibly innovative or ground-breaking happening here, but they’re just classically-designed, solid hockey jerseys. It’s hard to find anything to get incredibly excited about, but it’s equally hard to find anything wrong with it. The striping is classic and consistent. The red and white (and black) are prominently featured. 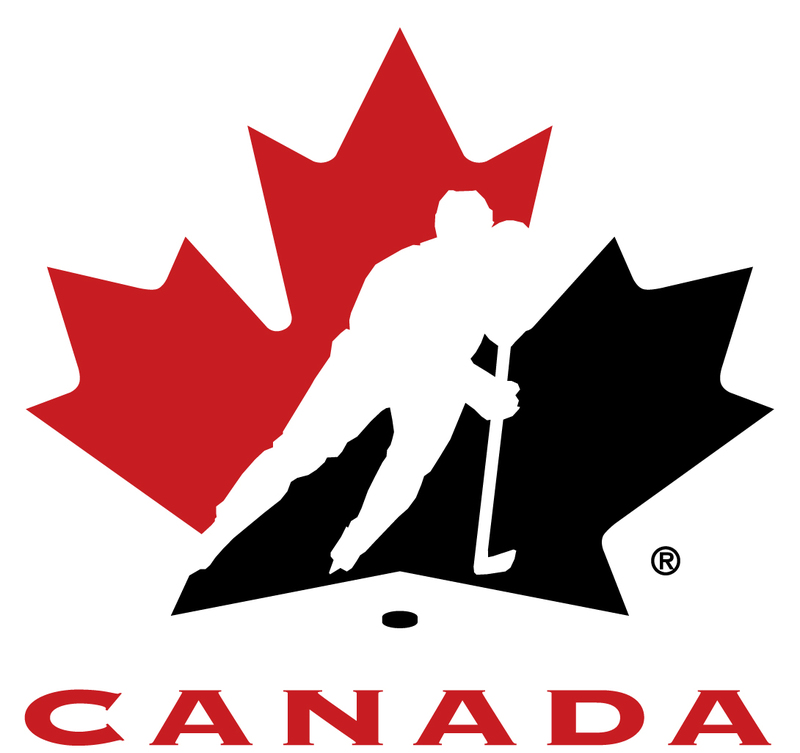 The classic and beloved Hockey Canada logo. The historic maple leaf shoulder patches are great. Oh, and two gold medals (men and women) came wearing this jersey too, which always helps too. Honestly, there’s not much else to say. It’s the quintessential hockey jersey design. Classic, simple, standard, gets the job done. The history of this team is really interesting, and its creation influenced the jersey design directly. In 1947, it was the Montreal Royals, but the issue is that they had some players being paid on their team, which was against the Olympic rules. 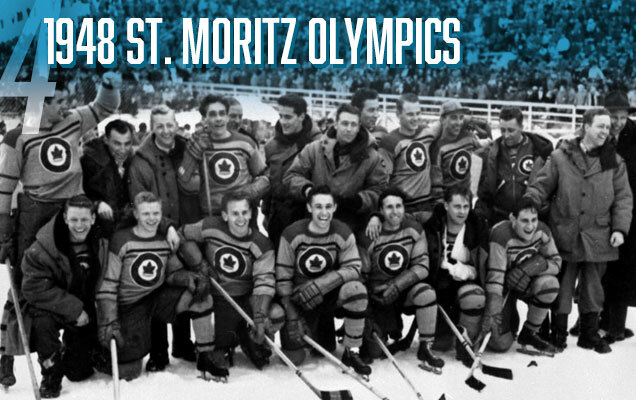 Canada considered just not sending a team to the 1948 Olympics, but instead a team of Royal Canadian Air Force members and army personnel – named the Ottawa RCAF Flyers – represented the country. 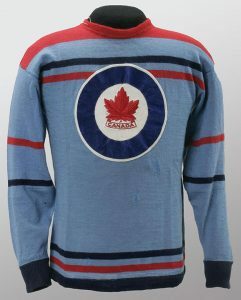 The Flyers, appropriately, had an RCAF-inspired jersey, with the maple leaf inside a thick blue-outlined white circle representing the RCAF logo (not too dissimilar to today’s Winnipeg Jets) with “Canada” added below the leaf. The jersey’s colour of sky blue was taken from the official RCAF ensign. The best aspect of these jerseys in (a) their relative uniqueness for a Canadian jersey in having a baby blue jersey as its base, and (b) that the crest really stands out, as it has the only white on the entire jersey (or sweater in this case). The striping is a bit inconsistent – with a different pattern right below the shoulder yoke, on the sleeves, and along the bottom of the jerseys – but having the stripes generally the same width alleviates that somewhat. For a Canadian Olympic jersey, it’s quirky, it’s unique, and it represents the closest to an underdog story as Canada has gotten in Olympic hockey. These aren’t the oldest jerseys to be featured on this list (foreshadowing! ), but they are – by far – the cleanest and most minimalist. They aren’t necessary unique, or examples of interesting design…or have much design to them at all, but damn, do they ever look good. 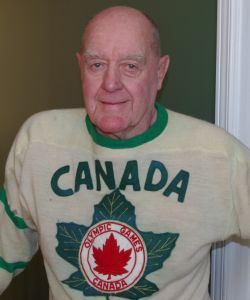 A white sweater with a ragged, asymmetric maple leaf on it, and the word “Canada” curved below it in a strong all-capped serif. Simple, straight-forward, slightly intimidating, and clean. 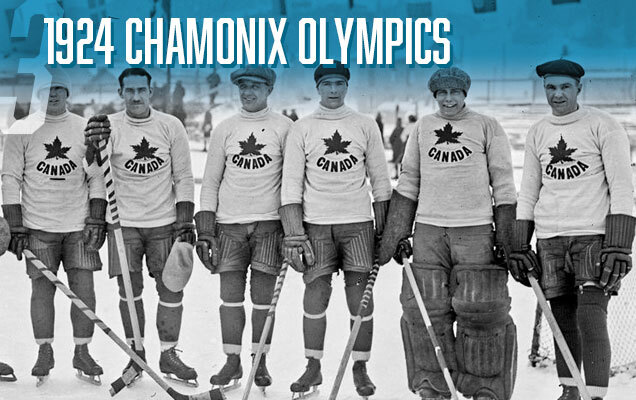 Canada was represented by the 1922 and 1923 Allan Cup winning Toronto Granites, and it’s easily the most dominant Canada has ever been at the Olympics. 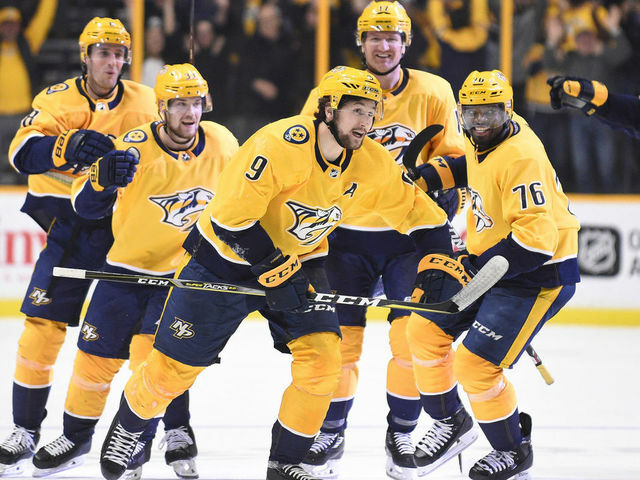 They outscored their opponents 132-3…in 5 games. They beat Switzerland 33-0. Czechoslovakia 30-0. 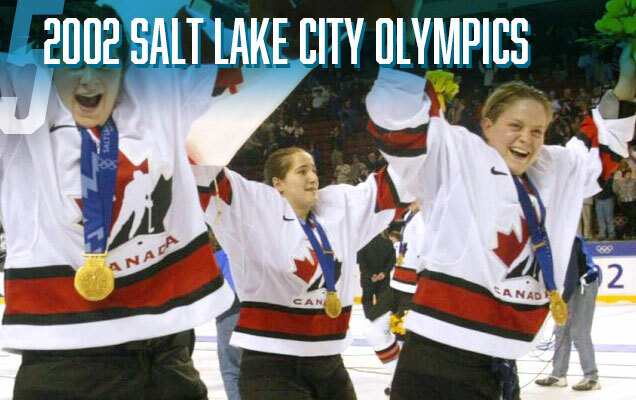 The only remotely close game was the gold medal game, which Canada won 6-1 over the US. That tournament’s leading scorer? Canadian Harry Watson, with 37 goals in 5 games. Jeeeeezus. 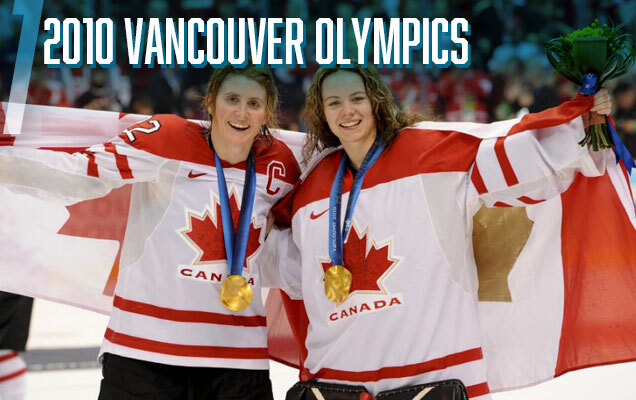 Think about that next time you complain about women’s hockey at the Olympics being a two-team competition. It’s absolutely nothing like it was when men’s hockey started, and women’s hockey is progressing at a rate way faster than men’s did. The only reason it’s not higher on the list is – by modern aesthetics – these are too minimalist, and would look like little more than practice jerseys in today’s arenas. But, throw a few clean stripes on there, and damn, they’d be hard to beat. 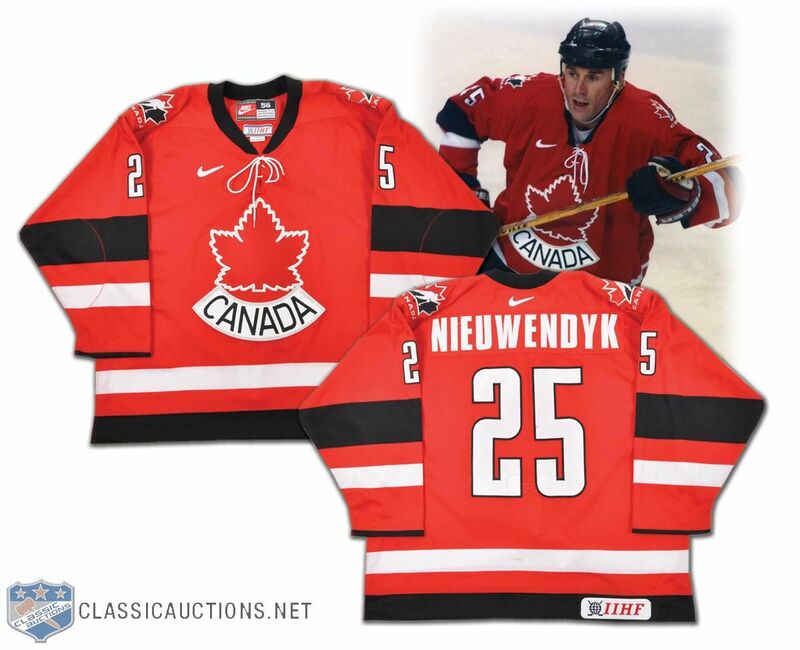 The OG Canadian Olympic jersey. 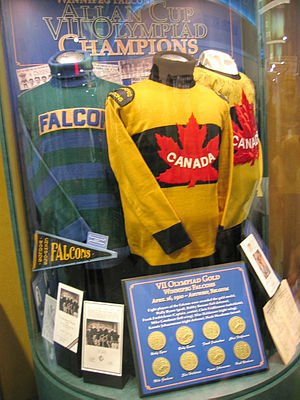 In 1920, ice hockey debuted at the Summer Olympics – only time that ice hockey was played at the Summer Olympics before permanently moving to the Winter Olympics four years later – and Canada sent the 1920 Allan Cup-winning Winnipeg Falcons to represent the country. 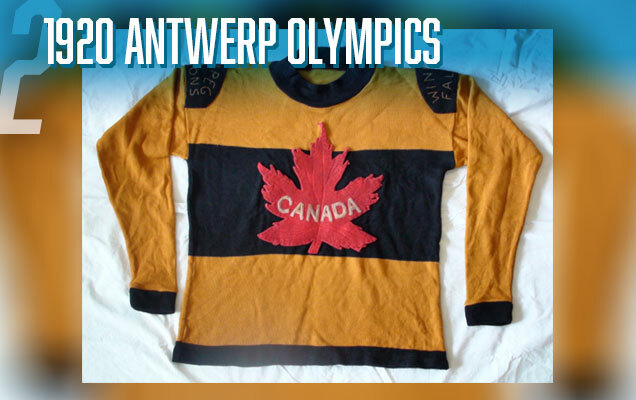 In a somewhat-brazen move, the jersey they wear to Antwerp has a solid gold base (which they easily followed up with a gold medal by outscoring their opponents 29-1 in the process) with a thick black stripe across the chest and thinner black stripes on the cuffs, collar, and along the bottom. It’s topped off with simple “Winnipeg Falcons” shoulder patches and a rugged rendition of a maple leaf in red with a curved white “Canada” on it. For a Canadian jersey, it’s pretty unique. Why gold? I’m guessing because it’s the Olympics and wanted to put the other teams on notice as to their intentions? Their non-Olympic jerseys didn’t have any close resemblance – different colours, different, stripes, etc – but the combination of gold, black, and red works well in its proportions here. There’s enough black and red to quiet the obnoxiousness of the dominant gold (looking at you Nashville), and the thick stripe of black is a great backdrop to make the red leaf have more visual impact. Having the leaf bleed into the gold gives the jersey more depth as well. And having Canada in white lets it stick out. 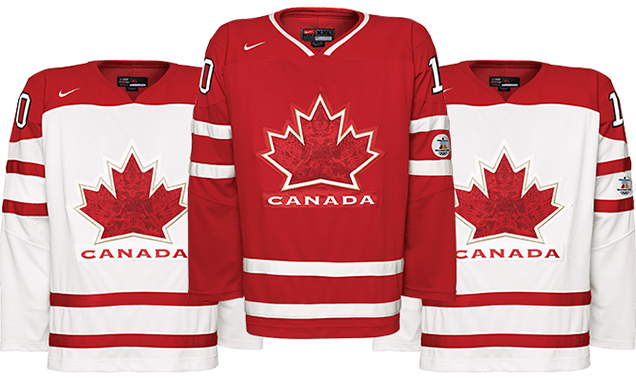 It’s a Canadian jersey that’s unique, balances minimalism with great detail, golden, and iconic. Easy decision to have it high up on this list. Two sentences ago, I said “balances minimalist with great detail”. And while the previous jersey had that, this one is the epitome of how that balance can achieve greatness. The best part of this jersey is the logo crest. 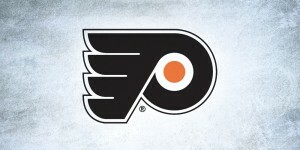 From a distance, it’s just a simple, stylized, iconic maple leaf, which is the most obvious crest for a Canadian team. No need to overthink it – the red maple leaf in the obvious recognizable symbol for Canada, so use it. 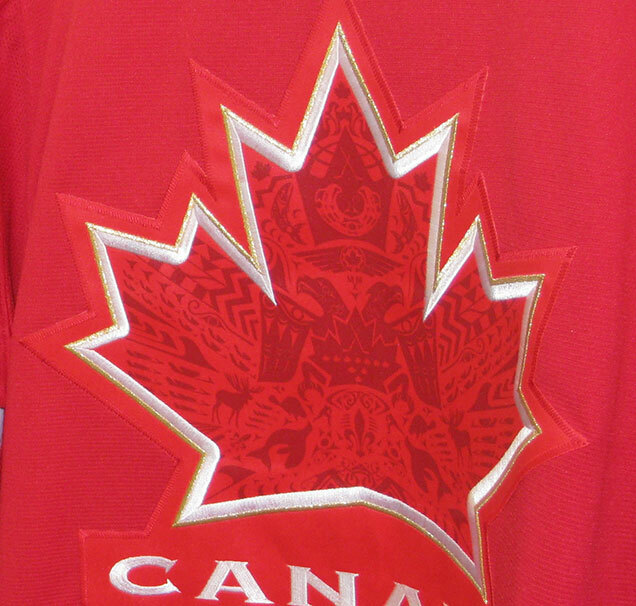 But it’s the detail in the maple leaf when you look at it up close that makes the jersey so awesome. There’s just so much to look at and enjoy here. The Indigenous culture has a strong presence, there’s moose, there’s orcas, there’s a fleur-de-lis, there’s tons of movement with the patterns, there’s just so much symbolism packed into this space that it’s rewarding every time you look at it. It’s just fantastic. I’m not crazy about the thin gold outline on the maple leaf, but hey, at least they backed that up. Golden Goal anyone? And the rest of the jersey compliments this subtle complexity with elegant simplicity. The simple two thin stripes on the sleeves and the bottom of the jersey are simple and classic. And there’s a noticeable exclusion of black on these jerseys – one of the few times that this has happened – but the red and white are so well balanced that you barely miss it at all. The one major element I don’t like is the font choice for the “Canada” below the maple leaf. Copperplate Gothic. Bleah. But, it’s taken from the Hockey Canada logo, so at least there’s a certain logic to it. Otherwise, it’s just such a great combination of classic, elegant jersey design with some really intricate and interesting modern touches, it creates a jersey that looks great at a distance, and even better close-up. And worthy of the top spot on this list. Like your 2,3 & 4 picks. #5) Never have like the Hockey Canada logo. 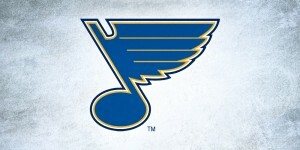 #1) The leaf logo without a stalk I find disconcerting. Don’t care for small details that don’t look like much anything from a even a short distance. Unfortunately my first thoughts for choices for replacements would look too similar in style to the 1924 sweater (1928, 1932, 1936). I’d go with the 1952 Edmonton Mercurys as one of my choices. 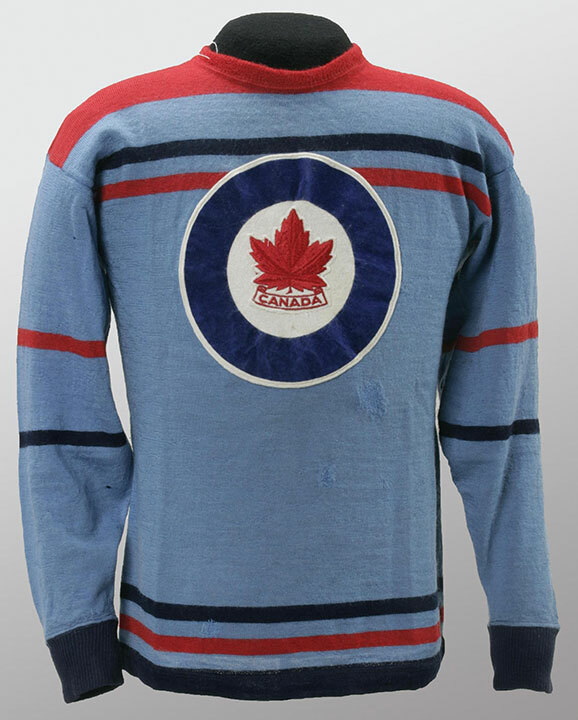 The other choice would likely be something similar to the 1924 sweater but in colour and with some stripes – the 2002 Olympics heritage jersey. I went with 1924 over ’28, ’32 and ’36 because I liked it better without the frame around “Canada”, but otherwise, yes, they were very similar and didn’t want two sweaters that similar to each other on the same list. I was close to including the Mercurys as well, but felt that jersey was more about the Edmonton team than Canada because of the logo crest. Will you do a ranking of USA Olympic jerseys? Sorry, not this time around, as we’re gearing up for the playoffs. But it’s definitely on the list for…4 years from now? Or possibly sooner than that. 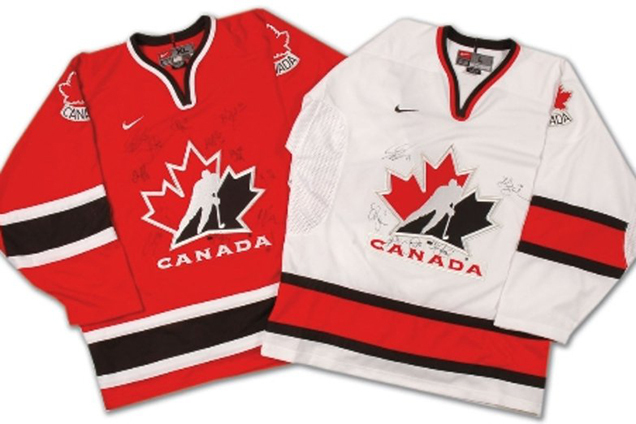 The Vancouver jersey is just too blatantly “Native” It screwed up the otherwise great Hockey Canada logo in many ways. It includes salmon, moose, beaver, and whale, and so as not to offend, a fleur de lis too” Surprised there wasn’t a doughnut, and the word “sorry” spelled out over the entrance to an igloo. Oh crap, we forgot an inuksuk (accepted indigenous spelling)! Well, lets make sure we put one on the sleeve. 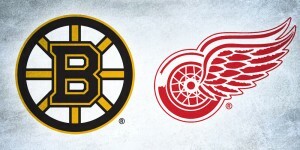 I am really surprised you missed commenting on the puck in the HC logo taking the place of the leaf stem. 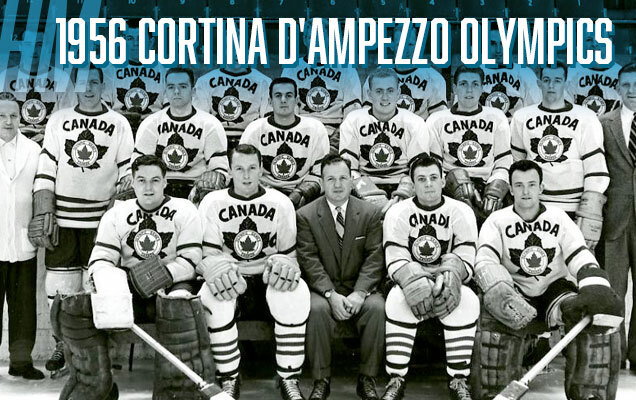 Too bad this wasn’t a Team Canada Top 5, because the ’72 Summit Series should be on this list. Not sure why HC doesn’t go to this one for the Olympics instead of butchering the logo over and over to appease the IOC and their hypocritical rules. …and I wish I could edit “Native” to say “Indigenous” instead. Sorry, said the Canadian. And what’s wrong with it having an Indigenous aesthetic?